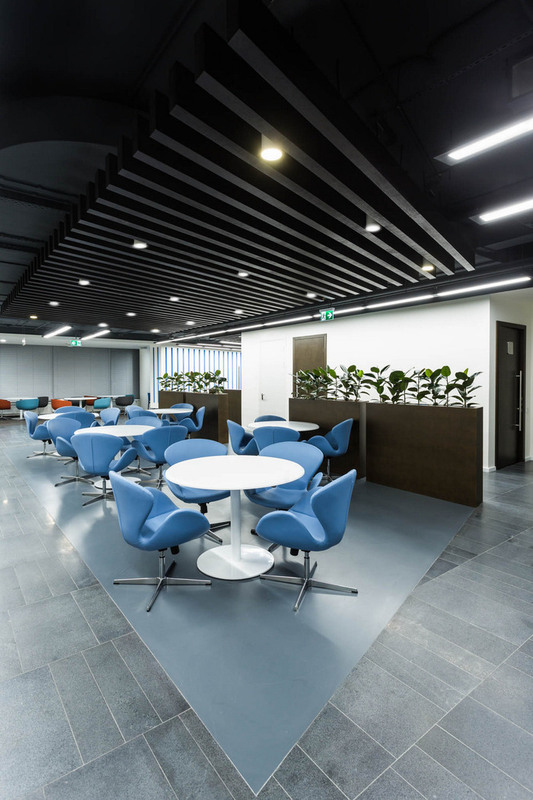 Aurora Group has recently designed the new offices of telecommunications company Rostelecom located in Moscow, Russia. The specialists of Aurora Group bureau had to create a single office for one of the largest divisions of Rostelecom – macro-regional branch “Center”. The new office located in the 5 “fingers” of 2 buildings of the office park Comcity, connected by bridges. A special element of the design was the use of the company brand in the interior. It appeared, for example, in colour: bright blue and orange accents in furniture, wall painting, and pattern of floor tiles. The panels with slogans of the company have installed in the entrance areas. Design of the office is aimed at efficient use of space for collaborative work and rest of employees, at association of employees from various departments and divisions. Priority is to locate work places – tables are situated along the windows, and all auxiliary facilities rendered in building core zone. In addition to the open space zones the negotiation rooms of closed and open type, separate offices for the management of the company, coffee-points, wardrobes, and many special technical areas are situated on each floor. For comfortable work in the open space area acoustic screens on the tables are provided. The carpet tile was preferred for flooring, the space itself is divided into zones (which prevents the echo effect). Using of multiple climate zones, of cold beams, uniform illumination gives the most appropriate solution for comfortable office work. Small sofas scattered around the office is a good alternative for negotiations. For formal meetings a large number of meeting rooms for 4-6 and 10-12 people are provided. For official events, exhibitions, trainings there is also a modern conference center in the office. 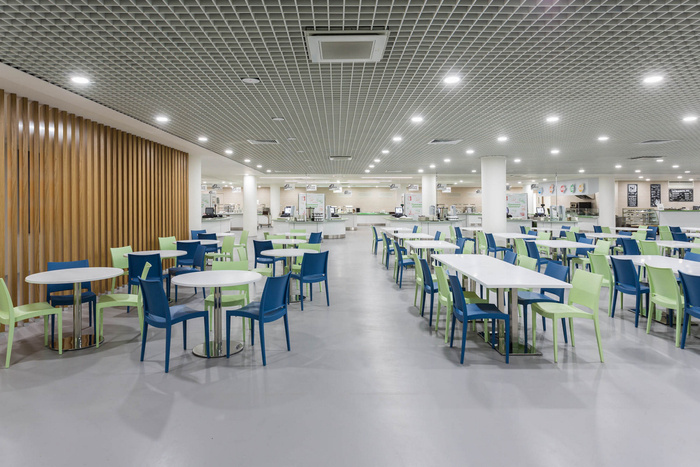 The space includes a media area, a transformable conference hall for 200 people, a showroom and a café with free access for all visitors to the office park. Rounded shape pavilion, the form of which repeats the elements of the Rostelecom logo, is a multimedia area “Hub”. It is made from artificial stone of bright blue color and is designed for meetings, negotiations and presentations of high-tech services of Rostelecom.